Just about everyone experiences low back pain at some point. You might strain your back while lifting, twist the wrong way, or sit or sleep in an awkward position. Your alarm clock wakes you up for another day and as climb out of bed, you immediately notice a sharp pain and tightness in your lower back. You know that if you don’t get some relief now, you won’t be able to carry on with your plans for the day. Acute low back pain is one of the most common reasons older adults see a doctor. 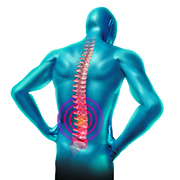 In fact, more than 80 percent of Americans will experience an episode of lower back pain at some time in their lives.